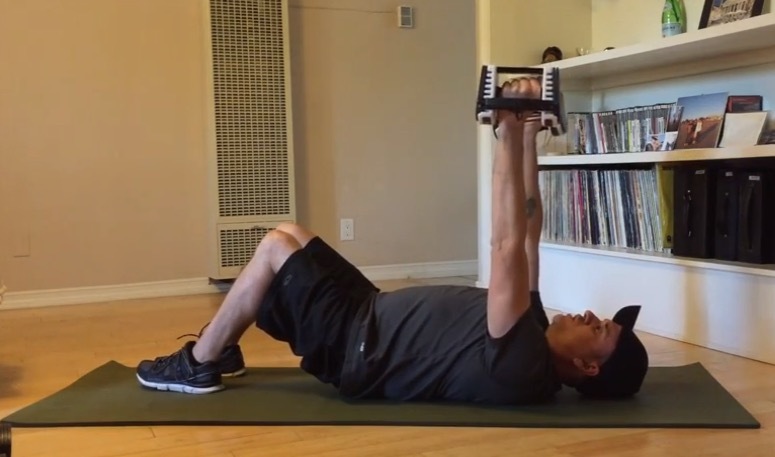 A super fun, cool and highly effective tricep exercise that I love to do. I created a new group on Facebook and it’s called “Health & Fitness for O.I.” If you have Osteogenesis Imperfecta, or you are a family member or know someone who has O.I., and would like to join, I invite you to request membership into the group. Since creating the group, I’ve had the pleasure of sharing with others that have O.I. about nutrition, fitness, exercising, and getting and staying motivated. A member by the name of Christopher posted about wanting to beef up his upper body, especially his arms. There were some great comments/posts giving him suggestions for various exercises and other work out methods to increase muscle mass. As soon as I read his post, I immediately knew that I wanted to share this specific exercise with him. It’s an exercise that targets the triceps and I learned it from my trainer, Alvin Presto (Presto Fitness). I knew that I could type out a description of how to do the exercise, but I figured that it would be most effective if I did a video that I could share with Christopher. So, here’s the video! Perhaps you’ll want to give this one a try as well and throw it into your arm workout! What is your favorite tricep exercise?